I often wonder about "timing" and why most of the things I pray for don't show up until that final hour. Have your ever experienced that? I wonder how many things in my life changed because I gave in too soon? Let me keep it real simple today...it's always too soon to quit. If you are thinking about giving up on a dream or idea take a moment today to ask yourself this question:"If the blessing you were waiting on was coming later today, would you still stop moving forward?" My guess is you would say absolutely not! Don't give up! Trust in the Lord and don't lean on what you know. Hold up your head and hold out your hope! You could be soooo close! 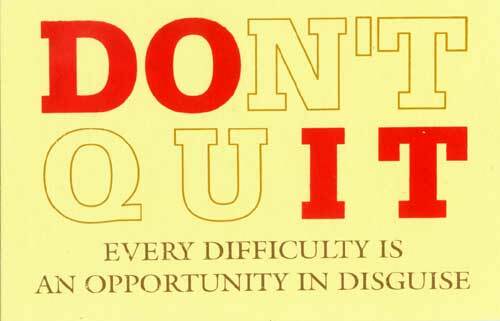 Don't quit...do it!